This meditation focuses on a unique monument: The Reformation Wall in Geneva, Switzerland. Though one would think this monument to be all about theology, upon reflection it remarkably enough turns out to be more about politics and the rising influence of citizens on governments in Europe and other parts of the world than about theological matters. In the West we are used to secular governments and take them for granted as the world standard. In my university state law book the professor warned me with the wise words that this order has become ‘so much second nature that we ourselves are not conscious of it anymore and consider it all too easily to be generally human.’ A useful warning for legal professionals in the global village! Societies can also be run through religions, tribes or kin, repression from armies or fall apart without any order. The stern warning by St. Augustine that ‘without justice states are bands of robbers’ is increasingly called to mind when we watch the TV news. In this time of remembrance of the liberation at the end of WWII it is equally relevant for us to consider. If civil order is not to be taken for granted, where did it come from? It was the outcome of a long process of trial and error that got decisive input from the Reformation. Especially the Genevan Reformers, the most important of them legal scholars themselves, engineered a societal model with freedom of conscience for individuals, while at the same time severing the church from the state. This process is neatly documented in the Mur de la Reformation or Reformation Wall in Geneva. But is it art? Well the statues of the Reformers on the monument originate in part from the same artist as the Statue of Christ The Redeemerin Rio de Janeiro, truly a global image bearer. Apart from this contribution by Paul Landowski, who together with Henri Bouchard was responsible for the statues of the Reformers, the monument is a work of art that deserves description in its own right. Primarily responsible for the giant wall of 100 meters wide is the Swiss architect Alphonse Laverrière, who won the design competition at the occasion of Calvin’s 400th birthday anniversary. The monument in Burgundian quartz links the 16th-century events in Geneva to developments elsewhere in the world. France, Scotland, theNetherlands, the United States, England, Hungary and Germany get their own sections in the bas relief. Above these sections, across the top of the monument, towers the Genevan creed Post Tenebras Lux, after darkness comes light. The oversized statues of the main Calvinist Reformers – William Farel, John Calvin, Theodore Beza and John Knox – stand in the middle, just above or on top of the word Jesus /ΙΗΣ,each with Bible in hand. At either side of them their political descendents Frederick William of Brandenburg, William of Orange, Gaspard de Coligny, Roger Williams, Oliver Cromwell and Stephen Bocskay are represented by statues next to quotations from political documents and events based on their Calvinist convictions. The whole has a distinctive Calvinistic flavour. What a difference with the Rio statue! Not nearly as impressive, but doesn’t that actually reflect the nature of the Reformational influence? Drama was put aside and reason valued. This monument resides in the city where for the first time in history all males were allowed and obliged to go to school, if necessary subsidized. We may take this for granted, but it was revolutionary then. It was a measure taken to make people responsible agents for their freedom of conscience. In the sections of the various nations influenced by Calvinism, political documents are cited. For instance, the Mayflower Compact depicts the ‘covenant’ that the Pilgrim Fathers agreed upon prior to their landing on American soil. The monument reflects a worldview that has contracted serious damage through the 20th-century World Wars and the following globalization – not only spiritual but also political damage. To the celebration of Calvin’s 500th birthday in 2009 far less attention was devoted by the civil authorities of Geneva than to the 300th birthday of Rousseau in 2012. Perhaps only people from the South still understand the special nature of the events portrayed on the Reformation Wall. Recently Nobel Peace Prize laureate Ramos Horta claimed at a U.N. conference inGeneva (Complexities of Peacemaking: The Untold Story) that in most places losers of elections are ‘second class citizens’. This vividly contrasts and helps to explain something of the importance of Calvinist Reformers’ more inclusive approach to secular power, as is so well portrayed in the Reformation Wall. 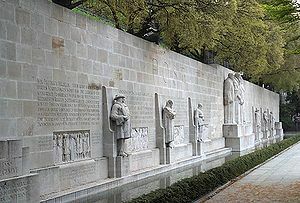 Alphonse Laverrière, Paul Landowski and Henri Bouchard: The Reformation Wall, Geneva, Switzerland, 1909. Alphonse Laverrière, a Swiss architect, made the overall design, while the main statues were made by Paul Landowski, a Polish-French monument sculptor best known for creating the statue of Christ The Redeemer in Rio de Janeiro, Brazil, and Henri Bouchard, a French sculptor. Albert Hengelaar is involved in establishing a presence for the World Evangelical Alliance at the United Nations in Geneva. He is married to ArtWay’s Editor-in-Chief, Marleen Hengelaar-Rookmaaker. The World Evangelical Alliance liaison office Geneva offers tours around Geneva to highlight the international political role of the Reformation. The proceeds support their human rights advocacy. See here: http://humanrightsjourneys.com.